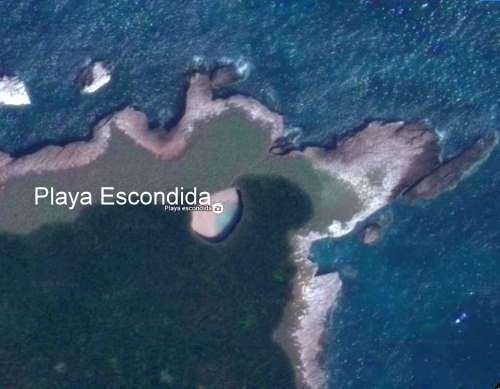 How was Playa Escondida (“Hidden Beach”) formed? Following on from our look at the potentially disastrous environmental consequences of publicizing Playa Escondida (“Hidden Beach”), one of Mexico’s most beautiful small beaches, we take a look at how this extraordinary beach was formed. Playa Escondida. Source: Google Earth. Scale: The beach is about 30 m (100 ft) long. Playa Escondida is on one of the small, uninhabited Marieta Islands, in the Marieta Islands National Park, off the west coast of Mexico, and relatively close to Puerto Vallarta. 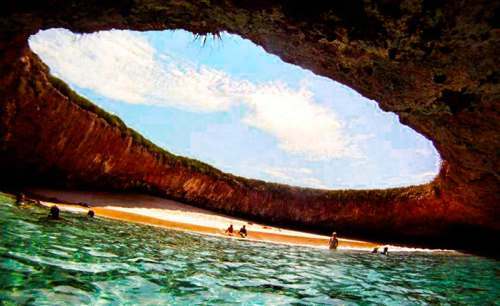 The Marieta Islands are formed of volcanic rocks and are an extension of Mexico’s Volcanic Axis. Just how was this beach formed? Prosser describes two alternative suggestions. The first is that the volcanic rocks were not uniform in composition and hardness but had differences in resistance to subaerial weathering and erosion. According to this theory, the weaker, less consolidated rocks were eroded more quickly than the surrounding rocks to leave a giant chasm in the ground. This chasm was then breached on one side by marine action. The alternative theory mentioned by Prosser, and the only one mentioned (though without citation) by wikipedia, is that the chasm was formed by human activity, specifically by the Mexican military who undertook bombing practice in and around the islands prior to when the area was given National Park status. Coastal geomorphologists might argue the case for considering a third theory, involving the formation, first, of the cove on the outer coast of the island, followed by a combination of marine and subaerial action to exploit a line of weakness in the volcanic rocks to create a landform known as a geo (a narrow, deep, cleft extending inland from the coast). This geo may have gradually lengthened over time, by continued cave formation at the head of the geo, with marine erosion at the back of the cave opening up a blowhole, a small opening to the sky. A sequence of collapses and blowhole formation, over time, may have created Playa Escondida, where the interior beach is the base of a former blowhole, where the roof has collapsed and the material subsequently removed by marine action or pounded into beach sand. Whatever the explanation, this particular geomorphosite is one of Mexico’s many natural treasures, and one well worth preserving for future generations. How valuable are Mexico’s mangrove swamps?